Sgt. Ken Matthews was posted from No.61 Base to 419 squadron on May 2nd 1944, joining many other RAF Flight Engineers already with the squadron. He arrived at Middleton St.George with 2nd. Lieutenant Joe Hartshorn's crew; F/O Tony Delaney (Bomb Aimer), Sgt. Jason Grumbly ( Air Gunner), Sgt. Vince Lorne (Rear Gunner), WO Don Lyall (Wireless Op. )and F/O C Hamilton (Navigator). Their first operation occurred on May 27th to Bourg-Leopold where they used the aircrafts guns to drive off a fighter attack somewhere South of Antwerp. The Lancaster had arrived late over the target, but this did not deter the pilot who returned the aircraft on to the target with the second wave of the attackers. 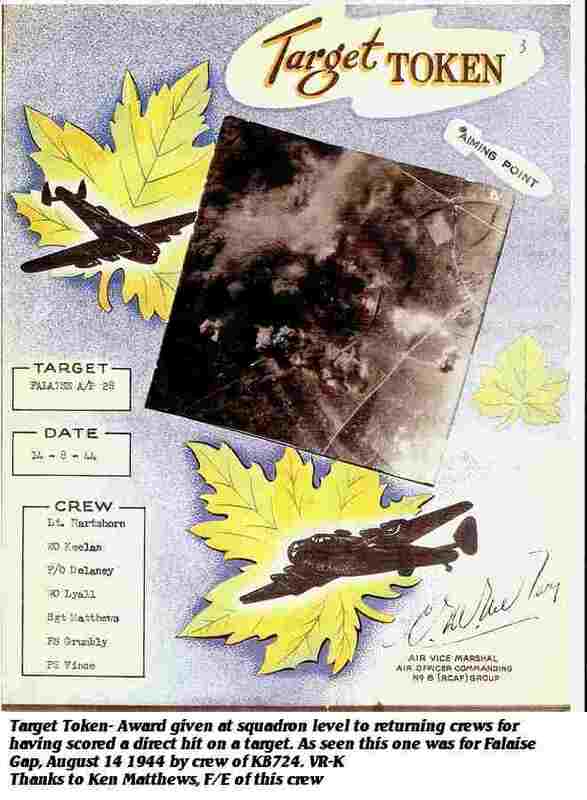 The Operations log shows that the trip home was not an easy one, they were to take evasive action on yet three more fighters before reaching base. 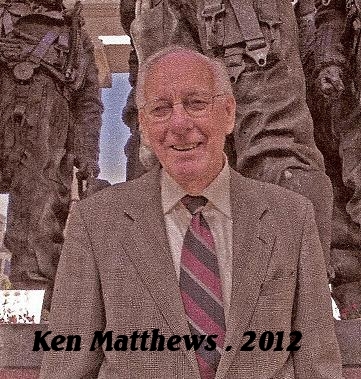 On June 17th Matthews and his crewmates were on an operation to Sterkrade. Again the Aircraft they were flying came under a series of fighter attacks. First confrontation occurred as they neared the targeted area. Corkscrewing out of it's path the Lancaster still came under attack by it's pursuer only to have a flak burst come near the port wing. Even before this first attack broke off another attacker. An ME-410 was spotted by Rear Gunner Sgt. Vince who had been keeping an eye open while Upper gunner Sgt. Grumbly was dealing with the first attacking fighter. The rear gunner Vince guided his captain in evasive action and let fly with a long burst of 400 rounds, beginning at 225 yards. The enemy fell away with his port engine ablaze, a claim for a "damaged" was submitted for this action. During the second attack still another , a third enemy aircraft was being watched by Grumbly, but it did not attack. The damage to the Lancaster, caused probably by both the actions of ground-to-air and air-to-air fire, affected the fuselage, bomb-bay doors, tail plane, rear turret, windscreen, "glasshouse", and the astral-dome was completely missing. All electrical equipment became briefly unserviceable, and was later intermittently serviceable and unserviceable. The Navigator, F/O C. E. T. Hamilton, who was wounded in the arm and leg, was the only casualty. (His wounds were serious enough to necessitate his replacement on subsequent operations by W/O W. G. Keelan ) . These adverse circumstances having arisen on the way to the target, it was much to the credit of Lt. Hartshorn and his bomb-aimer, F/O A. L. Delaney, that they managed to bomb at all. With the bombs delivered, Hartshorn took the Lancaster safely back to base. The incident was mentioned in the citation accompanying an award of the DFC to Hartshorn on 18 July. Delaney's part in the operation was partially responsible for the award to him of the DFM which was to become official in September. Sgt. 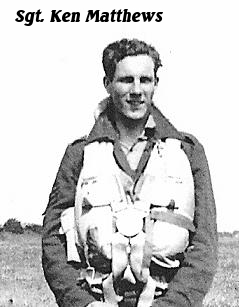 Matthews flew with almost same crewmates throughout his tour of 30 operations with 419 squadron. Retired and living in the Southwest of England and has been kind enough to provide this site with a number of photos from his collection.